I had two issues regarding Android version: scale and sounds.. the scale issue was solved by reading the documentation, and the sound issue was an incorrect asset type declaration. Well. First Ludum Dare. What an experience! I went into it not knowing exactly what to expect, and I’m still not exactly sure what happened. All That Are Lost Will Be Found is a game about Hero. Hero’s role is to seek out, and bring light to the Losties (no, not the TV show). Unfortunately, there are also evil creatures on the prowl. Hero’s only means of defense is an inner light that illuminates the environment for a brief moment. I finished the game! As time went by, I became more and more convinced that I wasn’t even going to have something to turn in by the end of the 48hrs. This, however, actually helped as this somewhat caused me to set more realistic expectations and lower the bar to a reasonable level. All of my tools worked. Having not participated in the warmup weekend, I was seriously worried that I’d be working away, and realize that I didn’t have the required software, or that it wouldn’t work correctly. None of this happened, though, and all my tools worked flawlessly. I slept. Originally, I had planned on powering through the competition for as long as I could, before collapsing. Instead–and due to the location I was working at–I got at least six hours of sleep each night, which in the long run helped immensely. I think that my original plan of pulling a 48hr coding session would have been about the worst thing I could have done. I adapted. There’s nothing more frustrating than making the decision to throw out everything you created in the first seven hours of the compo. However, on Saturday morning I realized that everything I’d done the night before just didn’t feel right. 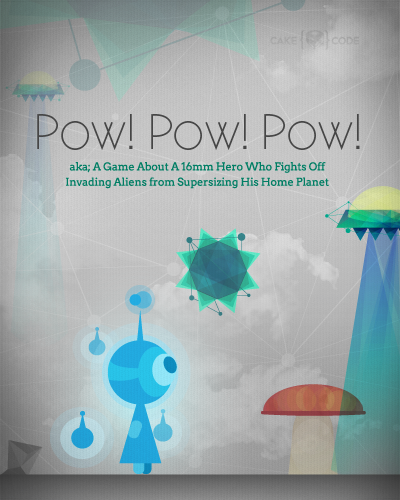 In essence, I was simply making another shoot-em-up platformer. So, I did what any good designer should be able to do: trashed the whole thing and started from scratch. Being able to do this helps detach me from the project and not wig out if I can’t get “that one feature” into it. Working with others. Normally, I think I’d have been inclined to take on the weekend solo, locked in an airtight room. This was not the case! I was working in the same space as a couple of other designers, which was great! It’s always inspirational to be able to get up and see what someone else is working on, rather than sitting in front of your project all day while your brain turns to mush. Eating. I practically starved myself during the whole 48 hrs. In retrospect, it would have been much healthier (and no doubt helped with brain functioning) to have taken the time to stop and get a good meal at least twice a day. I started off on the wrong foot. When the theme was released, I panicked. Then I did what comes natural to me in such situations: I began writing code without any idea as to what I was going to do with it. And then I dreamed up this massive project that was way outside of my abilities for 48 hours. Lesson for next time: see what the theme is, turn off computer monitor, and walk away until an idea comes to mind. This would have saved me seven hours of time spent on a bad, half-baked idea. Level Design. It’s the bane of my existence. I put this off until the last minute on Sunday, and wasted a lot of time working on minor details, rather than concentrating on making the entire game/level more engaging and fun (and then working on the details in the remaining time). Sound. I’ve never done anything with sound before, and I simply ignored it, as I didn’t know how easy it was to whip up a few effects in sfxr. In the future, I’ll create sounds along with the rest of the assets I create, rather than saving them to the end and hopefully having time to add them in. Forgot to declare assets ahead of time. There were a couple of Unity scripts I’ve written previously (in particular, a level generation one) that I fail to mention up front for possible use in the game. As such, I was stuck with the painful realization that the script is on my computer (I even opened it and looked at it once! ), yet I could not use it. All code, assets, and design done by me. 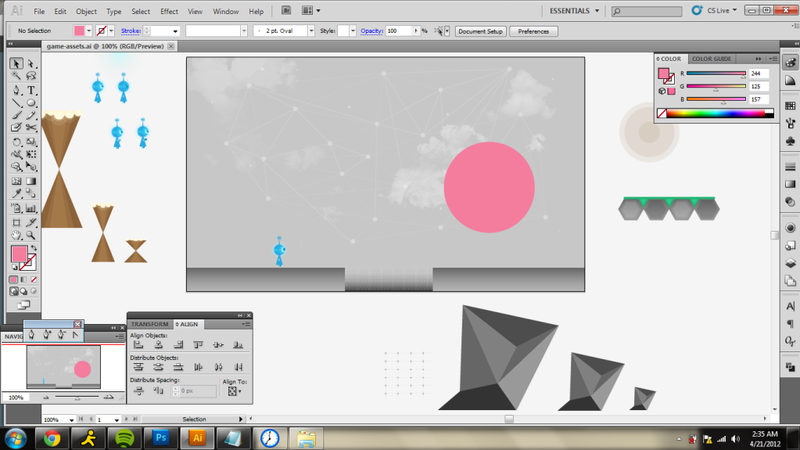 Created in 48 hrs on a Windows 7 desktop in Unity. Models/graphics were created using Blender and Gimp, respectively. Testing done on an additional Macbook Pro. In retrospect, the entire project turned out really well. I’m extremely proud that I made and completed a game, albeit a very short one! In the grand scheme of things it doesn’t matter very much, but it’s still cool. Go on, get on it! These are some of the planets you Mengs will be colonizing later today. Fish Tank Commander: Huge Success! It was a very non-standard decision to program my Ludum Dare as a Ruby on Rails web app, but the game I ended up with is incredibly feature-full and remarkably complete — which is not something you can often say after 48 hours! Four exciting unit types: The Speedy Seahorse, the Tanky Turtle, the Brutal Betta, and the Cheap Goldfish. Elo ranking system (like in professional chess) and XP earning for each game. See how you rank! Challenge people of your skill level! Discovering that none of my several available web servers were running Ruby 1.9+ and being unable to upgrade them. I ended up having to sign-up with Heroku to do the hosting, but this was indirectly good — see below. The AJAX interface for moving the units can be a little laggy. Unfortunately, there wasn’t enough time (and expertise) to develop a WebSocket solution — this will come after Ludum Dare is finished. Not enough time for me to play the game, so some good balance tweaks only became obvious to me after the deadline when I could get in a few matches. Not enough time to implement the several pages of additional features the game deserves! Especially automated matchmaking and email notifications. Hurry up and finish voting so I can improve the game! The battlefield doesn’t look quite as much like an aquarium as I had hoped. It needs some kind of border around it that looks like fish tank walls. One art please. Really knowing my programming language. In LD #22 I used Unity 3d, which I’m not very experienced with. But I use Ruby on Rails every single day for work. This was still a learning experience as I don’t use RoR to make games, but it meant that I didn’t have to use documentation as extensively (just occasionally to check parameter ordering for complex functions). A great schedule. Just as with LD #22, my plan was to use Friday for ideas and a skeleton/outline of the app, Saturday for core gameplay, Sunday for “fluff” like finalizing the art and adding auxiliary features. Despite complaining about not having enough time to do everything, I actually did much, much more than I thought would be possible in 48 hours. I think that midway through Saturday I felt that I had enough “game” to have been satisfied with submitting then. Working with Heroku. I’ve been wanting to play with this sort of dynamic, cloud-like hosting for a while and I finally got the opportunity to do so. Even the the fact that I wasn’t able to use my existing (and therefore effectively “free”) hosting is going to be a boon, as I’m feeling more motivated to complete all the features I want to make a very professional product. Good, high quality food at the ready. I made a pork roast on Friday night and had plenty of pre-washed spinach, lettuce, and other vegetables ready to go. Saturday and Sunday morning started with a huge breakfast, and I made sure to consume a lot of high quality food the rest of the day. It kept my energy levels high. Going for walks. It only took me 10 minutes to go around the block, but the four or five walks I took throughout the weekend were great for recharging my batteries. Streaming the whole thing and having hundreds of my YouTube viewers keep me motivated (and provide me with a to-do list of feature requests that will keep me busy for the next year). Once voting for LD #23 is complete, I’m going to get back to work on this project and turn it into something really, really amazing. I can’t wait. Good luck to everyone submitting their stuff and getting it up on time! 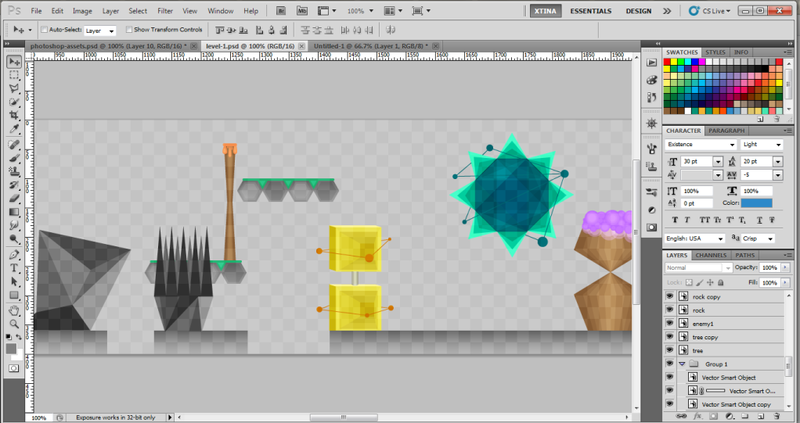 We’re still working like mad, this time with designing the level and making it into a more full-length mini-game of sorts. We’re aiming to get 2 levels done by tonight, with the possibility of going further to other levels. 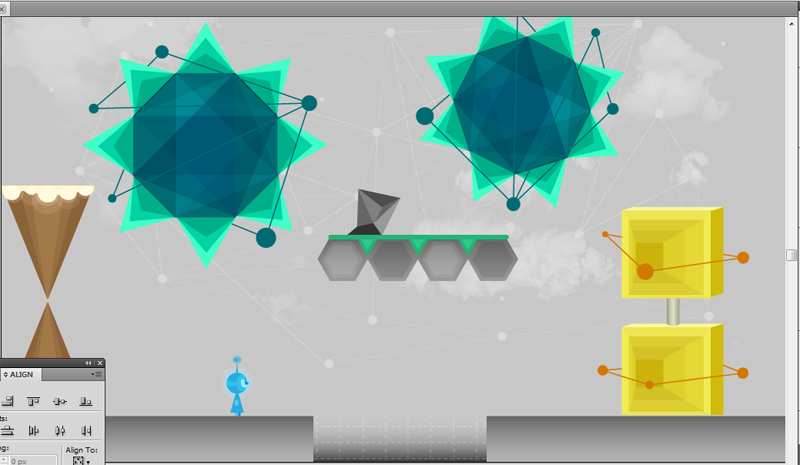 Here’s a sneak peek at our first level, mock-up’d by Cake. Pow! Pow! Pow! : First Playable Build! Yay, our first playable build! Ok, so it’s really not THAT bad. Zeik is busy hurriedly trying to get some sort of build out for people to demo. Until then, have a nice shot of my (Cake) workspace. Frantically working through some storyboard art for an intro and ending. Not to mention I have some sound editing to do later. After a full night’s sleep, I’m getting back to work. News for yesterday is that I created a 3D model for my ships! But I haven’t decided yet whether to use ships or zeppelins. My idea is that if I go with ships, I’ll create a strategy/action game where you control a fleet of ships. Control is indirect. You set a speed and bearing with your mouse and then click another ship to adjust its course, and so on. With more money made, you can buy new ships. With zeppelins, I’m thinking of more like a pure action game, where you fly around the world, picking up and dropping off cargo while avoiding hitting the AI zeppelins. There are some pros and cons to both. May be difficult to control. Easy to run aground. But maybe that’s a good challenge. Avoids the problem with latitude wrapping at the poles, as you can’t reach them by water. Don’t need collision detection with the ground texture. Will need AI zeppelins to collide with so it won’t get too easy. Hard (for someone like me) to model. Our Karma Machine at Work! Meet Chii! He has been performing a support role in the team since last Ludum Dare. Here you can see him PURRFECTING our art! We are currently working on our idea, but we don’t feel like lifting the veil, yet. Tune in for more updates in a while! Cake’s update! I’ve got a screenshot of what I have as of right now. I just woke up about an hour and a half ago, and started working an hour ago so I think I’ve made good progress on enemy design. 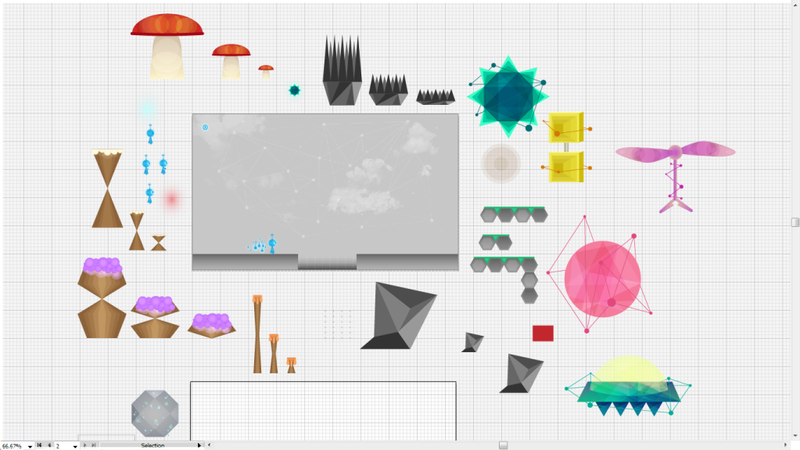 Here’s a shot straight from my Illustrator workspace. I decided to zoom in a little and give you guys a clearer shot on the details. (It’s at 150% right now.) I still have lots to do, but I’m pretty pleased with the enemy design as of right now. Another art update from Cake here. I don’t really feel like I got much done. Maybe I did? I don’t know, but I had wanted to get most elements of the world completed by tonight and it’s currently 2:30am. I either don’t sleep or I go to bed defeated. From 11pm to 2:30am I basically got a death-gap designed, some rocks, platforms, a real floor, and some action sprites for the attacking motion. “Tiny World”… I have to admit at first I was at loss. 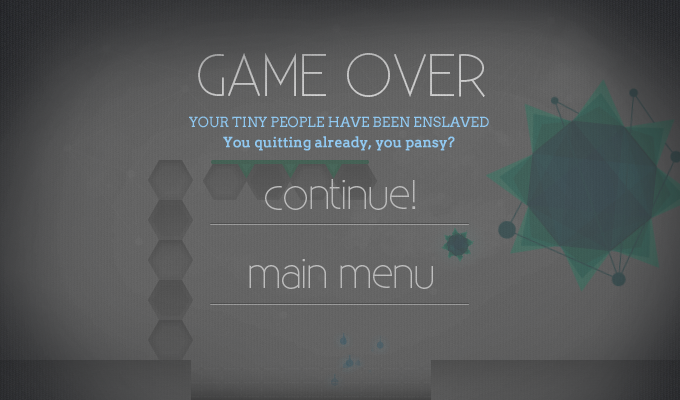 I only had one idea : a tiny planet with a man running/jumping around it but wasn’t satisfied with that. And with thinking, other ideas came, and I remembered a game concept I had last year about nuclear fission and atoms and neutrons and chamber of reactions, etc… So I thought “that’s my tiny world! The worlds of little particules trapped in a chamber of chimical & physic reactions. What you’ll have to do : In the chamber of reactions, you’ll move differents blocks of various material to make bouncing or not your reactive elements. The more collisions between reactive elements you make, the more powerful your weapon will be. 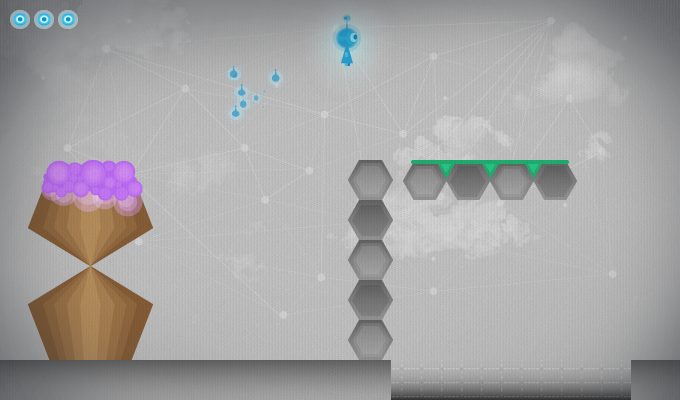 Gameplay : you can only control 2 cursors with Z(or W)/Q(or A)/S/D and UP/LEFT/DOWN/RIGHT to move reflective blocs. Those blocs have different physics property making them more or less bouncy. 21 queries executed in 0.118 seconds.